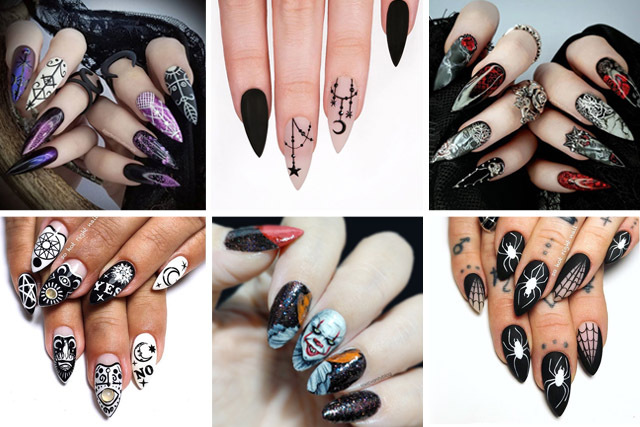 Halloween is just around the corner, and that means it’s time to start planning your scary Halloween nail design! Plus, if elaborate costumes is not your strongest side, you can always go all extra with your nails. 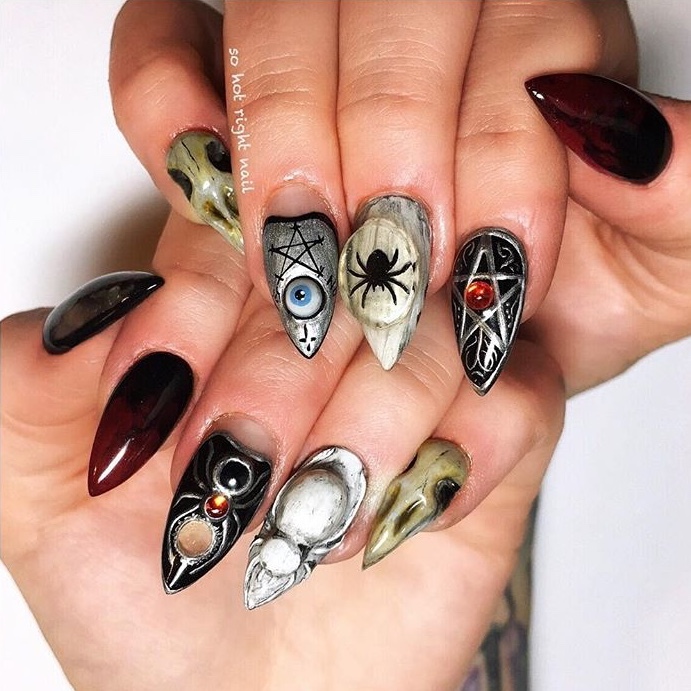 Today we present you 12 scarily stunning Halloween nail designs that will make you feel like the Heidi Klum of Halloween nail art. 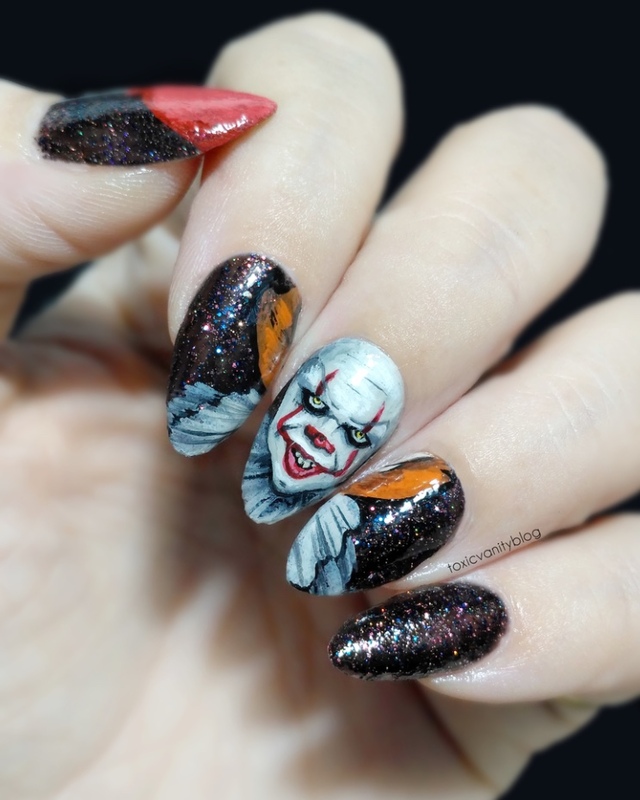 From Creepy Clown to Vampire Bride nails, and from 3D Witch nails to an easy black magic manicure, this Hallloween nail art compilation has it all to get you inspired! 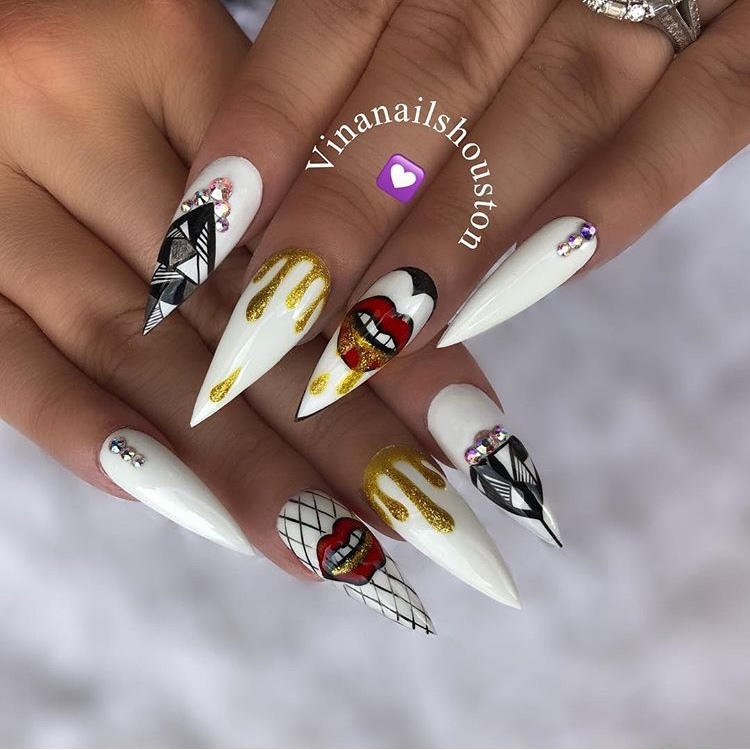 While some of these designs are done in gel and on long stiletto nails, most of them can be easily recreated in nail polish and adapted for short nails. Take a look… and make sure to pin some of your favorites, so you remember the idea! How-to: This 3D Halloween nail design is hand-painted with gel. 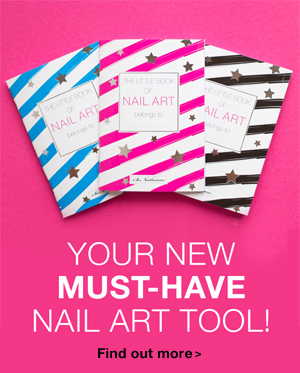 Use thin liner nail art brush for the flawless fine lines and star patterns. How-to: This incredible Creepy Clown design is entirely freehanded with acrylic paints using 01 Warrior brush, which is perfect for realistic portraits. 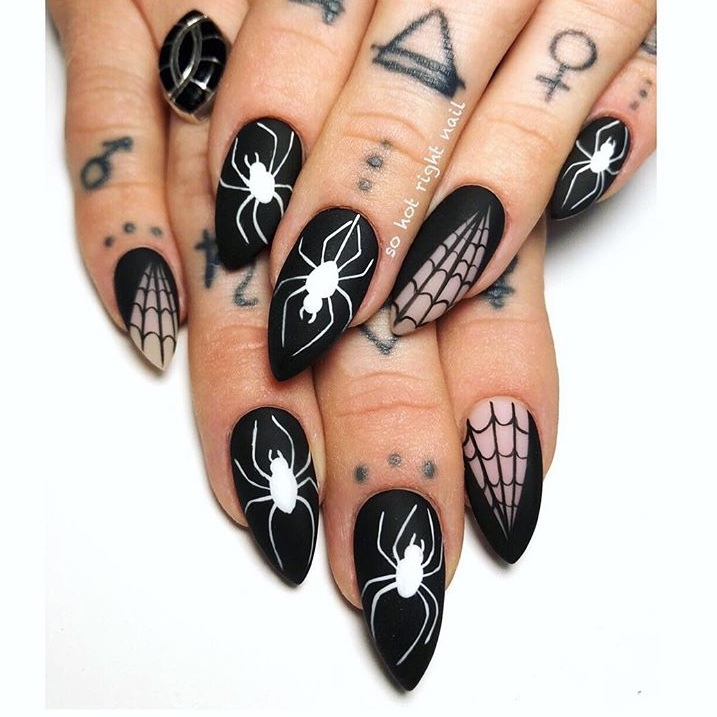 How-to: To recreate this incredible Halloween nail design use long striping nail art brush for the flawless long, thin lines and shorter liner brush for the twirly details. 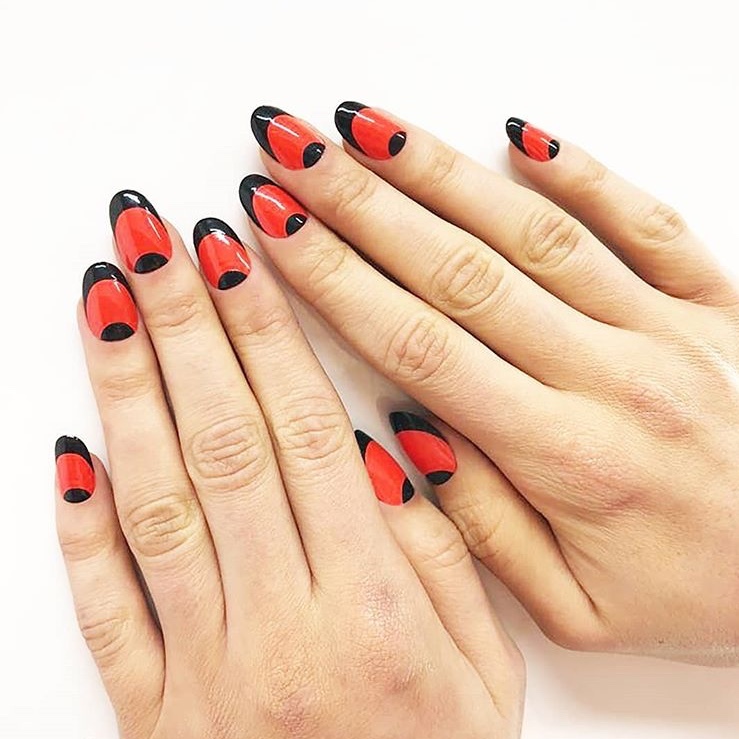 How-to: Halloween nail designs don’t have to be gory or complicated. 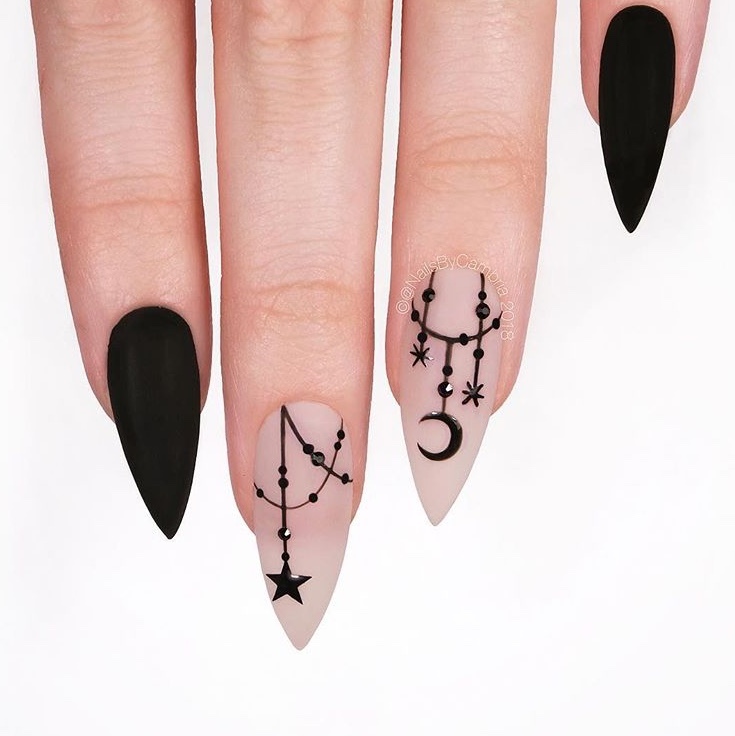 For a quick, chic Black Magic Halloween mani, simply apply Celestial stickers over dark nail polish and secure your design with a matte top coat. Done! How-to: This witchy nail design is hand-painted with gel, but can be also done in polish. Use thin liner brush for the intricate thin lines and small black rhinestones to add a touch of luxury. 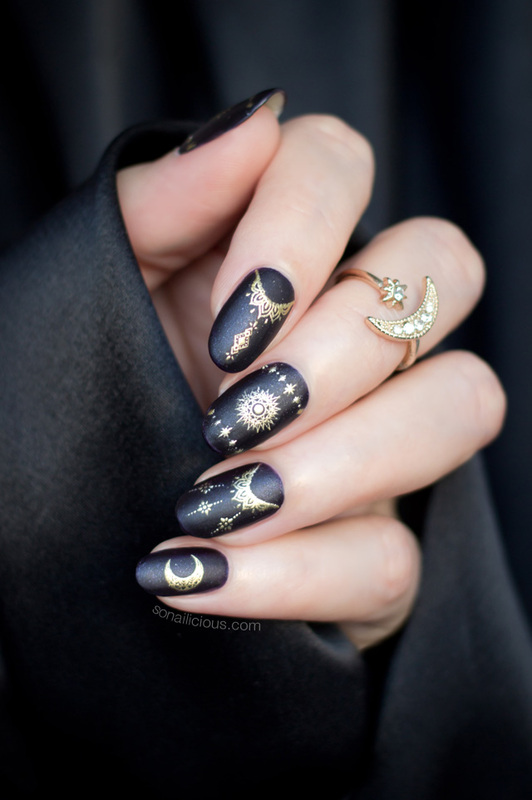 How-to: To get these eerie half-moons, use these French manicure stencils or freehand the half moon details with 02 Needle Brush. 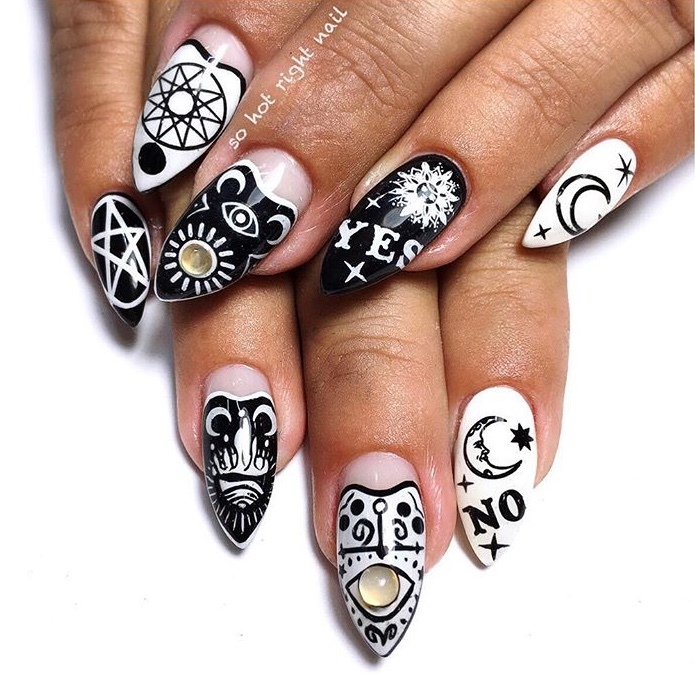 How-to: To recreate this beautifully complex Halloween nail design use fine liner nail art brush to paint thin lines, moons and stars. 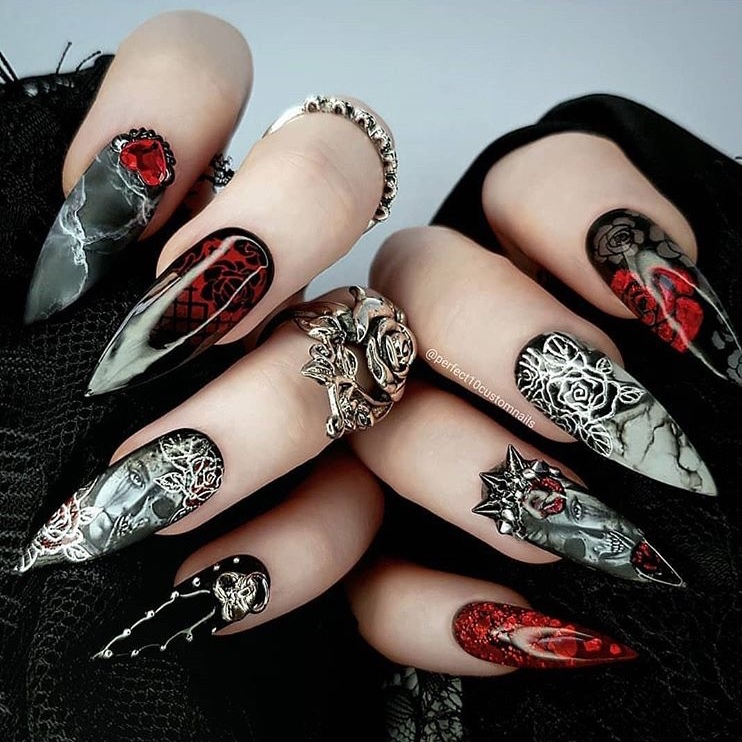 How-to: To recreate this chilling Halloween nail design use angular brush to create the smoky patterns and fine detailing brush for the intricate details, like lace and roses. 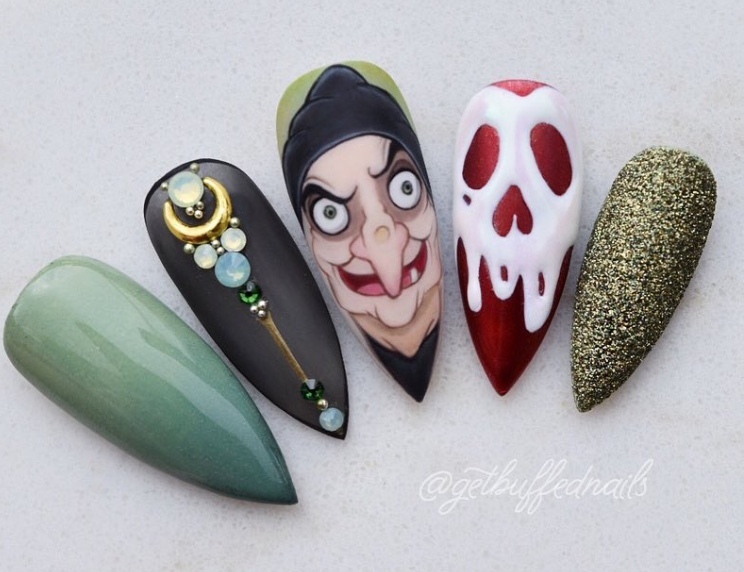 How-to: Inspired by the Old Hag from Snow White, this Halloween nail design is done in gel and acrylic paints. Use fine detailing nail art brush to paint realistic portraits like this Old Hag and metal beads and opal nail gems for your accent nail. 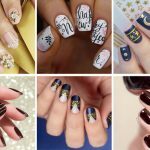 How-to: To recreate this beautiful Halloween nail design use long thin striping brush paint the lines and geometric patterns and detailing brush for the dripping gold details. 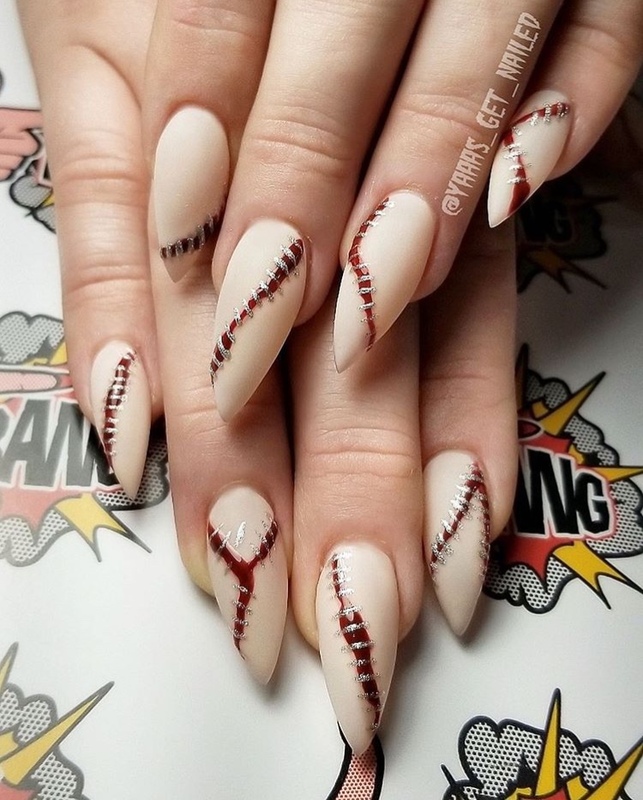 How-to: You can do this scary but beautiful Halloween design easily in either polish or gel. 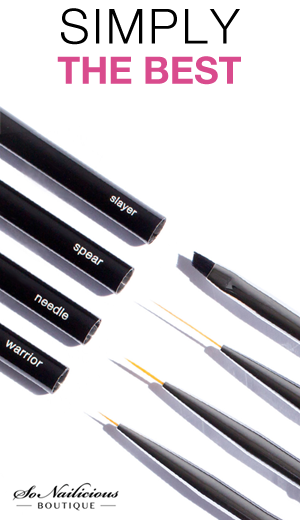 Simply use 02 Needle brush to paint the blood lines and 01 Warrior brush for the silver stitches. 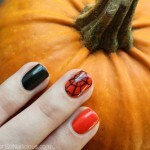 How-to: This stunning spiderweb nail design is hand-painted with gel. Use thin striping brush to paint the perfect spiderwebs and spiders. 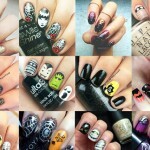 Hope this Halloween nail art compilation inspired you to try some new manicure this year! 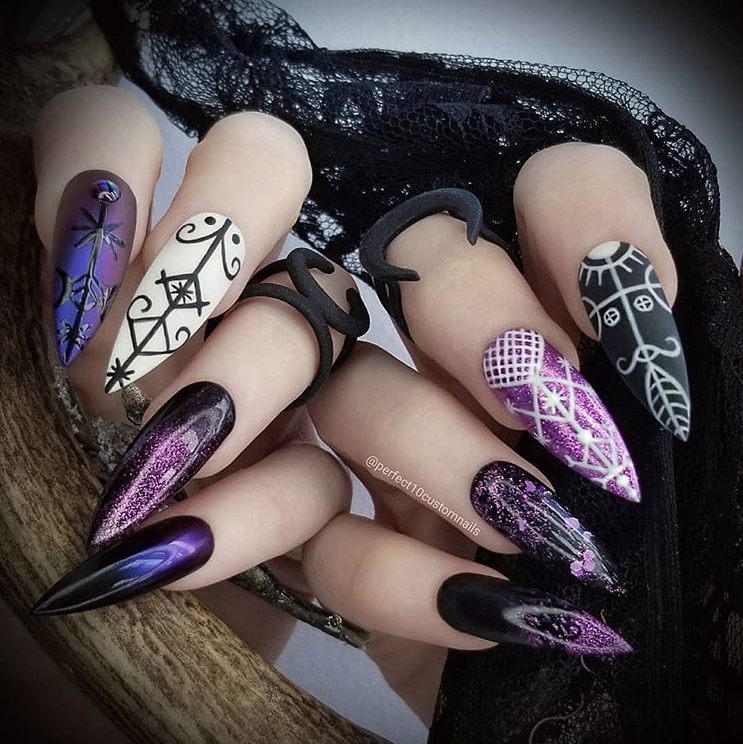 I’m seriously considering wearing stiletto tips for Halloween, so I could recreate the Voodoo Halloween nails in their full scary glory! 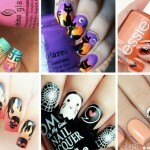 Which Halloween nail design from the above compilation is your favourite? Will you dare to try it?